Uttar Pradesh(UP) Assembly Election 2012 dates: Election Commission on Saturday announced the dates for the assembly elections in Uttar Pradesh which will begins from 4th February in Seven phases. 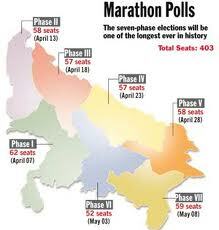 UP would see polling on February 4, 8, 11, 15, 19, 23 and 28. The Saturday announcement ended the suspense over poll schedule on which ride the fortunes of embattled Congress.